Take one initial idea and discuss with an author friend. Allow God’s inspiration (via plenty of idea sparking and prayer!) to fire possible story lines and characters. Add five more authors and mix well. Marinate in story inspiration, more prayer, and plenty of group discussion. Add a pinch of differing opinions to add spice to the mix. Bake for eighteen months to allow the flavours of each author’s unique story and characters to develop fully. Serve to readers while still hot. 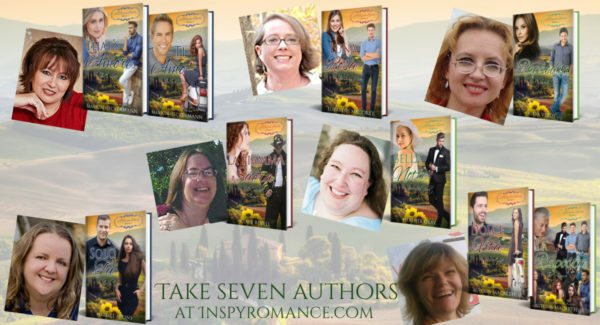 Of course, every multi-author project is different, but that’s how it worked for A Tuscan Legacy, a new nine-book multi-author series launching from April 17th. It started back in September 2016, when I mentioned to Marion Ueckermann we could consider a multi-author series for our next group project, like a Love Inspired continuity. Each book a complete romance, no cliff-hangers, but with a story thread running through the books to link them all together. I had no idea what it would be about, but it just felt right to do it. We threw around some ideas via email and Facebook messaging, often both writing the same thing at the same time. LOL, turns out we do that a lot! We both had characters with Italian backgrounds we wanted to give stories of their own. Hers is Rafaele, best friend of the hero in A Romance for Rose. Mine is Rachel, the grown-up daughter of 50-something heroine Maggie in Least Expected. I knew Rachel had a tough and unforgiving Italian grandmother she’d never met, living in Tuscany. All it took was to give Rafaele the same grandmother, along with three siblings and three American cousins, and A Tuscan Legacy was born! Well, it took a little more than that. Like most authors, we have way more ideas than we have time to write the stories! So we asked God to send us the right authors to work with on the series, then asked some Christian contemporary romance authors we knew and liked both as people and as authors if they’d be interested in joining us. God really blessed us with who He provided! Each of us so different. Each bringing our own talents and opinions to the set. Each taking the sketchy background provided for the eight cousins and turning them into fully fleshed out characters of their own, giving them real and relatable personalities and distinct stories. I’ve loved watching as every author brought something new and fresh to the series and added their own unique style. And seeing other authors at work reminded me yet again how when we do any creative work, whether that be writing, crafting, cooking, gardening, art, or raising a family, we become co-creators with God of this little part of His creation He’s asked us to be part of. It’s a wonderful blessing and a privilege. Working closely on scenes like that is a time-consuming challenge that simply doesn’t arise when writing our own series books or working with other authors on a set of unrelated books. But it’s turned out to also be an unexpected blessing, bringing out nuances and insights one author alone might not see. Books 1, 2 & 3 are now on preorder, with the next six books coming soon. You can begin your journey to Tuscany on April 17th with Marion’s Book 1. That’s Amore is Rafaele’s story, introducing all the cousins as they come to the family Tuscan villa in spring to celebrate their grandmother’s eightieth birthday. Book 2, Elizabeth’s story, is set in Washington DC. Book 3, Alexa’s story, takes readers to Texas! By Book 9, when they reunite at Villa Rossi in early fall, all eight cousins have found their lifetime love, as well as deepened their relationship with God. We hope you’ll enjoy taking the journey with us! To find out more about the series, read book excerpts, and be notified when each book releases, visit the A Tuscan Legacy Amazon page and click the yellow “Follow” button! And a quick reminder – today is the final day of the Books in Bloom spring promo hosted by Valerie Comer. If you love bargain Christian romance, please visit the promo page to see the free and 99c ebooks on offer! Have you ever travelled to Italy? If so, what did you love most about it? Or if you haven’t visited the country but would like to, what would you look forward to most about your trip? One comment on this post before April 10 will be randomly chosen to win their choice of my ebooks. Hey Autumn, I have preordered the available books and am excited to read them. I think the series sounds fun- thanks for revealing more about how the series came about and what was involved in writing them. I have not visited Italy but would love to- the Dolomites, Piedmont area…I am a History teacher, so Italy is obviously a destination I would love to explore. Thanks for preordering, Wendy. I hope you enjoy the series! Those areas do sound amazing to visit. For such a small country, Italy is so diverse in its landscape. And yes, the history! Autumn, it was a huge blessing for me to be invited to be in this series! We have a great group of authors, and the concept is so awesome to me. You and Marion have done tons of work on organizing and developing the series, and I couldn’t be more grateful. I’m looking forward to the release of the first book and all books afterwards! Autumn, you’re so sweet! Thank you so much! Hi Autumn! Wow! I enjoyed reading how the authors “cooked” up this delightful series. The enthusiasm of the group is catching. My first three books are preordered. Readers, order your copies today for just 99 cents. Thanks for the generosity of the authors. You will not be disappointed by these well crafted inspiring stories. Europe is a delightful continent to visit. Beautiful landscape and historical sites abound. While I have had the opportunity to visit Germany, Austria, France, Austria, Poland and Switzerland; and been at the airports in London and Amsterdam; I have never been south to Italy. I would love to see the Tuscan vineyards, Florence and Rome. Happy Easter and best wishes. Renate, thank you so much for pre-ordering our books and all the support you’ve given to this series! I live the travels you’ve done. I think of all of us you may have travelled most within Europe – and I live here! I would love to visit Tuscany. I’ve spent exactly one day in Italy, and would love to spend longer there! I have never visited Italy but that’s one of my dream vacation. I don’t know what I would love to visit. Just being in the country and eating the food will be all I need. I would love to spend some time in Italy, too, Colleen! A friend and I took a holiday to France, and hired a car to drive across the border to Italy for one day. We had the most amazing meal! I’m very excited for this series to come out! I’ve nrver been anywhere outside of the USA, but would love to visit Italy some day. We’re excited to share our books with you! And I hope you’ll get a chance to visit Italy. Thank you for commenting! Thank you, Melynda! We’re excited too. This series has been developed over such a long period, hard to believe it’s finally here! I hope you love the books, and that you get that trip to Italy someday, too! I loved every place we visited – from the tranquility of Tuscany, the architecture and history of Rome, the quaintness of the coastal villages of Cinque Terre, the hospitality of friends in Modena, and the incredible wonder at a city built on water as we visited Venice. Three best things I discovered: Buonconvento, one of the most beautiful villages in Tuscany (and is mentioned in That’s Amore); the amazing gelato (mentioned several times in both books LOL); and pici pasta, the pasta of Tuscany (also mentioned in That’s Amore, and tried and tested here at home too). I’d love to visit the south if I ever got the chance to return: Pompei, the Amalfi coast; and perhaps some of the little islands surrounding this beautiful country. Marion, you were so blessed to have that trip! I love the photos you took. As I’ve never been to Tuscany, I’ve pored over your pics and done a LOT of Googling to get the feel of it. There are so many places I’ve love to visit there! I’ve never been to Italy, but I would look forward to seeing Rome and all the ancient history! Plus the beauty of the land. Thanks for the opportunity! I hope you’ll enjoy taking a trip to Italy with us through the stories, Lila! I can’t imagine all the coordination and diplomacy required to accomplish this series. With all the great authors involved, I know it’s going to be a winner. I’ve never been out of the U.S. and at this point I know I never will be. My husband was in several parts of Italy during his stint in the navy. He enjoyed the northern part but was not fond of Naples. This was in the early 80’s before I knew him. It’s been an amazing learning experience working together on this, Sherri. I hope you enjoy the books. I have never been to Italy and at my age…never will. However, I look forward to visiting through the Tuscany series….headed over to order! I hope you love the books, Jackie, and the adventure of travelling the world in them! Thank you for your support of our series, Jackie Smith! The series sound like fun. Looking forward to it being released. Thanks for all the hard work! I’ve never traveled to Europe although my daughter did travel to Italy with her orchestra in college. She brought me back a small painting of Italy. Almost 20 years ago now, my husband and I got to take the train down from Switzerland to Milan, Italy, to visit a fellow who had been a high school foreign exchange student living with Jim’s family years before. The best part of the visit was Francesco’s wife’s cooking! YUM! I’ve read about a Tuscan Legacy and I’ve been waiting for it. Despite having little (sometimes no) time to read, this series has caught my attention. It was a great idea and I’m looking forward to it. Congrats. I’ve always wanted to travel to Italy, mostly Tuscany (another reason I’m drawn to the books) mostly through beautiful movie sceneries. Hi Priscila! I hope all is well with you. That’s what drew me to Tuscany too, I think – so many films have been set there, and it really is beautiful! LOL, I’m very glad I sent Maggie in Least Expected that long-ago summer au pairing in Tuscany and not somewhere else, because that’s what decided the setting. I’ve mentioned before that we needed to read Rachel’s story, so I totally agree Maggie’s Tuscany trip was just the perfect setting. I’m so glad to get to write Rachel’s story! And Maggie will pop in there, too! I knew what the theme would be for Rachel’s book right from when she appeared in Least Expected, and Tuscany is the perfect setting for that to happen. I’ve pre-ordered the 3 so far, and love this type of collaboration. Looking forward to the whole series being released. I’ve never traveled out of the country (USA) so have not been to Italy, though my husband was there years ago in the service. Because I’m half Italian I’ve always wanted to go to Italy, but haven’t. My daughter went for a month and sent back beautiful photos. If I could go anywhere I’d go to Sicily where my family is from, or up to Florence. Sicily sounds a fascinating part of the country, Marylin. I’m glad your daughter got to visit and see where her ancestors came from. Hope you get to visit someday too. And Florence – oh my – all those galleries! I am blessed to have read an ARC of the first 3 books. I love them.Everyone did a fantastic job. If I could journey to Italy I would like to stay in a pensions in a small town in Tuscany,view the sites and do a food tour. have never went to Italy but is on my bucket list! Love to see the beautiful countryside and eat real Italian food! Hope you get to make that trip, Shelia! I had half-a-day in Italy once. LOL, and most of it we spent eating! Congrats on your new series!!! I have never visited Italy, but if I ever had the chance to I would love to ride in a gondola, eat gelato , and eat pizza. Sounds good, Andrea! Hope you get to do all three! I have been so excited to have this series releasing soon! I have never been to Italy, other that through Marion’s photos that she has shared. Because of Marion’s recommendation, I would want to tour Buonconvento, which Marion called “one of the most beautiful villages in Tuscany “. And of course, I would have to try the gelato and the pici pasta. They looked good in the pictures! I loved those photos of Buonconvento, too. Another wonderful place to add to the “Want to Visit” list! i always wondered how so many authors could write about the same people and settings. It fascinates me how the stories relate and yet come from such different insights. Thanks for sharing this story with us. I read That’s Amor and really loved it looking forward to reading the others. Like fine wine a little at a time. When i graduated from high school ummmm so many years ago I went on a trip to Europe. We saw 6 countries in 4 weeks. I loved every minute. Rome was so full of ancient history and it made the Greek mythology i loved come to life. The people were friendly. I knew just enough Spanish to be dangerous. Have always wanted to go back and now i have through Marion and That’s Amor. Thank you Marion for your real life stories, they bless me. Hi Renette! We did it by each taking a character and focusing on them. Some of the stories will show more interaction with characters from other books, some less. Just like in a real family! Marion’s Book 1 and my Book 9 will be the only books with all the cousins together. Marion did a wonderful job handling that in Book 1. I hope I can do as good a job on book 9, which is still in progress! Of course you will do a wonderful job of book 9, Autumn. You’ve done a masterful job on everything that I’ve read of yours. Can barely wait for the entire series. I’ve been blessed to beta read books 1 and 3. Good reading is an understatement. Waiting with bated breath for the whole series. Thank you so much, Judith! Your comment put a smile on my face. And if you’d like to beta-read for me, just let me know! Even though I’ve not visited Italy I know I’m going to love being there while reading these amazing books! I’m so excited to take this journey with all these talented authors! It’s a world tour, Mattie! Book 1 – Tuscany. Book 2 – Washington DC. Book 3 – Texas. Book 4 – Rome. Book 5 – London. Book 6 – mainly US based, with some international travel. Book 7 – Sydney. Book 8 – Wales and Tuscany. Book 9 – mainly Tuscany. I have not visited Italy but would love to. So much history and beauty in one country. Piazza San Marco in Venice. I would love to return to Europe one day. That sounds a wonderful journey, Jennifer. Though maybe exhausting too! A lot of cities and a lot of countries packed in there. I hope you do get back for another trip! This series sounds so fun! I’ve never been to Italy but I think it would be cool to visit Venice someday. I’ve read one book set in Venice and really enjoyed getting to travel there through the author’s eyes. Yes, Venice would be so amazing! We need one of the authors in the series to write a follow-up set there.